Got stuff on your to-do list that’s been hanging around for-ever? Half-started projects lingering around indefinitely? Are you the Queen of Putting It Off? A recent Project Me survey found that procrastination is a top struggle we all face. It either induces guilt or puts you under a stupid amount of pressure by leaving things until the last minute. Crazy making! Having stuff on your to-do list for days/weeks/months weighs you down, nags at you and makes you feel guilty. So how do you stop thinking about it and just do it? 1. Ask yourself – is it really important? This is the first step. You need to know why you want to do something to have a deep enough motivation to actually do it. Get clear about your why. If you decide that it’s really NOT important, wipe it off your list – and out of your mind. If it is important and there’s a deadline attached to it – just do it before it becomes urgent. When you put things off until the last minute all of the time, you’re in firefighting mode. Plug away at the important but not urgent (yet) stuff to create a calmer life for yourself. Set yourself 3 MIT’s (Most Important Tasks) each day and do those things first! If you’re not cracking on with something because it feels overwhelming or like it’ll take too much time, chunk it into smaller steps and just take the first one. This works especially well with projects. Print an Ideas Into Action Sheet and create a step by step game plan with deadlines for each step – and schedule them into your calendar. This really does work! Operating from a messy to do list? Crossing it off, adding it on, picking and choosing whatever’s calling to you? That’s so old skool. Smart, savvy list makers know better. You need a proper system and a plan of action to get the important stuff done first. I teach this in my Master Your To-Do List Workshops – come and join in! You won’t regret it! 6. Find a motivation buddy. Tired of dragging your feet on certain tasks or projects that you want to do, but never make time for? Enlist a friend who’ll accept no excuses. The power of accountability is not to be underestimated. Talk it through with them, tell them what steps you’ll take and when you’ll do them by. Meeting up once a month with a Power Pal or Power Posse is an amazing way to get added accountability and a motivational push in the right direction. 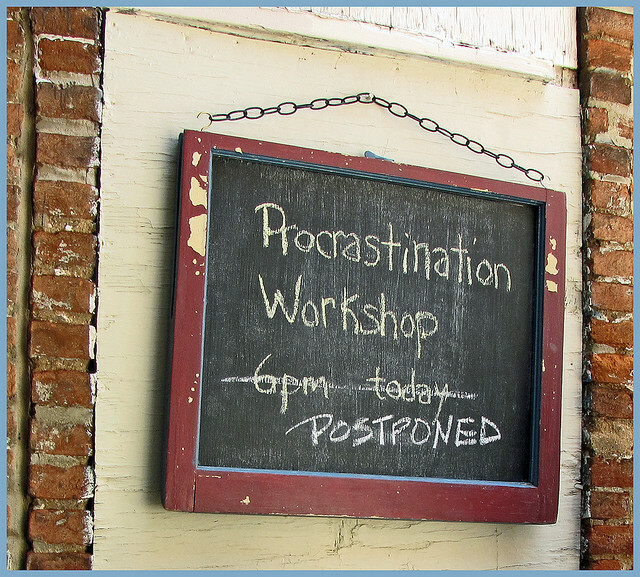 Stop labelling yourself a procrastinator. When you quit thinking of yourself this way you break the self fulfilling prophesy. Consider yourself a doer! In my Master Your To Do List Virtual Workshop I help busy women like you get on top of those endless to-do’s and create a system to make it all easier. I help procrastinators to feel enthusiastic about the things they usually put on the back burner and I teach productivity and organisational skills that really work – no matter how busy you are! Click here to learn more. In the comments below share something you’ve been stalling on and why you never get to it. What tips do you have for overcoming procrastination? Great post! My number one tip is take 5 minutes everyday to open, sort and “deal with” your mail. This is one area that can quickly take over my life if I let it get away from me! I like the idea of having 3 MIT’s. I get so bogged down sometimes that I don’t even know what to start with, so then every day I am doing urgent, last minute things. For me identifying the 3 MIT the night before is crucial. Otherwise I tend to do whatever comes first to my mind. But I kick off between 6:30/7am! Wishing you fantastic luck for the next 60 days!! I tend to stay out + if at all possible, off social media + my inbox in the mornings. I find, afternoon is best for me to catch up with these things. Such a great idea Theressa. I’m my most creative in the mornings, yet if I go down that dark rabbit warren of social media or take a peek at my email inbox first thing…. my morning disappears!